its cinco de mayo. i just love this day mucho. i know its become a crazy americanized holiday these days, but i just like to think of it as a celebration of how wonderful mexican food is. haha. gooooooo mehicoooo. i felt the need to do something else fun for my cinco de mayo spread again since i went a bit kooky for it last year, too. i made homemade tortillas, chimichurri (not very mexican, but oh so good on tacos), mango grapefruit salsa, various taco combinations, black bean & white cheddar taquitos, guacamole, and grilled corn with white cheez, cilantro, lime & cayenne. OLÉ!! first ya take the homemade tortilla. ya stick the smashed black beans on the tort. THEN, ya sprinkle the cheese. pro tip: use some smashed beans on the very edge as a sort of glue to hold the tortilla in rolled up position. slowly place each taquito in 1/2 inch of medium-high heated vegetable oil in a skillet. let brown, and flip once to fry and brown the other side. remove and let drain on paper towel covered cooling rack. THEN you scarf. aah the sandlot. how i love thee and all your nostalgia. and s'mores. summer is coming!!!!!!!! ps. i had my first s'more of the year this week. thats how you really know summer is nigh. also have you ever made a s'more with the chocolate graham crackers?? scrumptious! i filled the inside with just beans and cheese because i prefer toppings (like salsa, greek yogurt or sour cream, guac, etc.) to be cold on top. btw, we exclusively use plain greek yogurt as our sour cream agent anymore. i like the thick texture and tart creamyness. and plain greek yog is much more versatile to have around anyway. "this would be good on a pork chop!" "this salsa is just the perfect refreshing summer salsa. and not too spicy!" why thanks, people! i would agree with pete on the bitterness of the grapefruit now that i've eaten it on two separate occasions. be sure to get a nice ripe SWEET pink grapefruit for it. grilled corn is a great thing to have around for tacos, in salads, with everyyyyythinggg during the summer :) we grill up a bunch of ears, cut it off the cob and store in the fridge to have on hand for all the eats. normally i shy far far from taking any food photos in bright uneven sunlight like so ^^^ but for cinco i make exception! the sun is shining and the guac is flowing! lalalala la bambaaa. livin la vida locaaaaaa. adios! 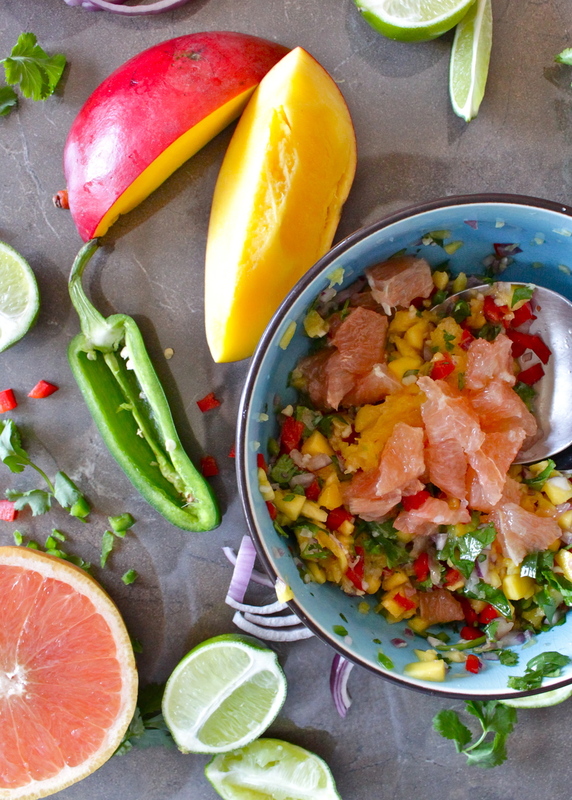 fresh mango & pink grapefruit salsa. it's may! it's may!!!!! hip hip hooray! the month of may calls for fresh fruits and colorful foods. cinco de mayo is coming up here real quick...i've put together quite a spread to celebrate/to 1 up my spread from last year. coming up in a later post. i'm currently hiding inside on a super fabulous sunny sunday. i hate to do so, but pete is jackhammering a bunch of cement at the back of our driveway and its sewww loud and unbearable. so so sorry, neighbs. i'm actually really excited about what he's doing because it will essentially widen our backyard to twice the size that it is now! just some very loud noises until then. back to fresh fruit salsa. i'd never had pink grapefruit in a salsa so i thought to give it a whirl. i love grapefruit and didn't want it to feel left out of all the fruit salsa fun. i personally think it added a good tartness to a type of salsa that can sometimes be way overly sweet. you hafta watch out for some mango salsas, especially store-bought...toooo sweet and swimming in sugary syrup. i also really, really love grapefruit, so i enjoyed it in this combo. if you don't fancy it, perhaps leave it out or just use a half a grapefruit. i ended up using close to a whole one since a lot of it was pulpy stuff i had to toss. peter was only concerned that the grapefruit was sorta bitter and wasn't chopped up small enough, but i think it was because that particular grapefruit could have been sweeter. he got all the bitter bits. make sure to get a juicy, ripe, sweet pink grapefruit! best of luck to ya. another note is that i didn't necessarily want to use red bell pepper. i wanted to use a small red chile, but couldn't find one at the store. i just used a tiny bit of the red bell for color, but would have used any other little bit of red fruit or veggie just to get that color in there. the red bell pepp flavor in there was starting to throw me off because it reminded me of the flavor combo for my tuna salad recipe, which was very veird since i was trying to channel the mango flavors. i would have used a strawberry, tomato, a cherry, plum, etc. ideally i wanted this to be a spicy red chile, and would have also used only half a jalapeño in that scenario. Chop and mince all fruits and veggies as instructed above. Place in a medium bowl. Add garlic, salt, pepper, cayenne, and vinegar and toss gently with spoons until everything is evenly combined. Drizzle lime juice and any remaining grapefruit juice over the top and toss again. Keep cold or chill for 15 minutes before serving. Serve with chips, on tacos, sliders, etc! !